Note: This article relates to the Pushover Notifications pro add-on. 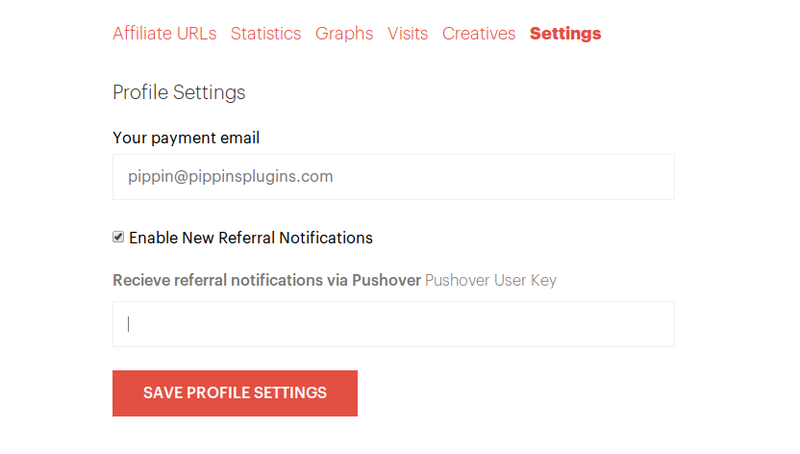 The Pushover Notifications add-on is simple to setup and only has a single option to be configured. This add-on requires that you have an account with Pushover.net. If you do not have one, registration is free. This add-on also requires a Professional or Ultimate AffiliateWP license. First, install the add-on on your WordPress site running AffiliateWP. If you're not sure how to install the add-on, please consult the installation guide on installing AffiliateWP. Add-ons are installed the same way. Once you have entered your Application Key, your affiliates will have a new field available in the Settings tab of the Affiliate Area that allows them to enter their User Key. Any affiliate that has entered their User Key and has new referral notifications enabled will automatically receive push notifications anytime a new referral with a status of Unpaid is awarded to their account.